EEG-biofeedback has been reported to reduce symptoms of autism spectrum disorders (ASD) in several studies. However, these studies did not control for nonspecific effects of EEG-biofeedback and did not distinguish between participants who succeeded in influencing their own EEG activity and participants who did not. To overcome these methodological shortcomings, this study evaluated the effects of EEG-biofeedback in ASD in a randomized pretest–posttest control group design with blinded active comparator and six months follow-up. Thirty-eight participants were randomly allocated to the EEG-biofeedback, skin conductance (SC)-biofeedback or waiting list group. EEG- and SC-biofeedback sessions were similar and participants were blinded to the type of feedback they received. Assessments pre-treatment, post-treatment, and after 6 months included parent ratings of symptoms of ASD, executive function tasks, and 19-channel EEG recordings. 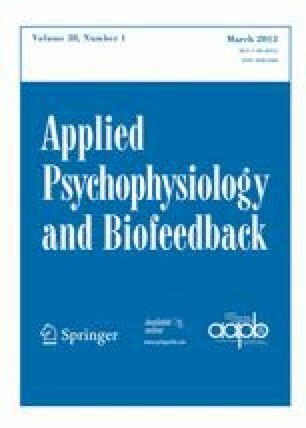 Fifty-four percent of the participants significantly reduced delta and/or theta power during EEG-biofeedback sessions and were identified as EEG-regulators. In these EEG-regulators, no statistically significant reductions of symptoms of ASD were observed, but they showed significant improvement in cognitive flexibility as compared to participants who managed to regulate SC. EEG-biofeedback seems to be an applicable tool to regulate EEG activity and has specific effects on cognitive flexibility, but it did not result in significant reductions in symptoms of ASD. An important finding was that no nonspecific effects of EEG-biofeedback were demonstrated. We would like to thank the board of VSO Mariëndael, Arnhem, the students that participated in the study, and the EEG- and SC-biofeedback therapists who assisted us. We offer thanks to Fonds NutsOhra, who financially supported this research project. We thank MindMedia for sharing in the availability of biofeedback equipment and BrainClinics Nijmegen for providing us with biofeedback supplies.